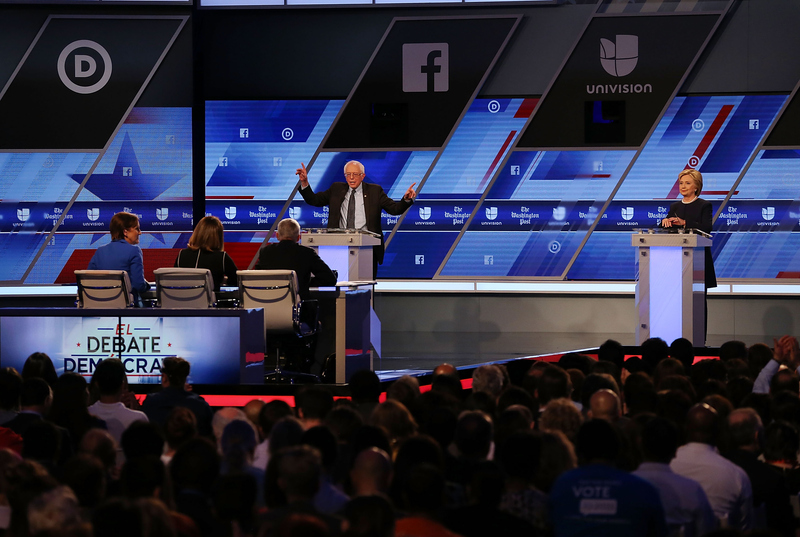 At the Univision/CNN debate on Wednesday, both Bernie Sanders and Hillary Clinton wouldn't call Donald Trump "racist" when asked by the moderators if this was an appropriate word to describe the Republican frontrunner. Instead, the two Democratic candidates gave non-answers — or, to put it differently, they refused to call Trump "racist." A lot of their supporters on Twitter weren't happy about this, but there could be a deeper reason why both of them refused to answer the question. The question was simple: Is Donald Trump racist? Clinton responded by saying that "there will be a lot of time to talk about [Trump]" in the general election, then went on to call his rhetoric "un-American." Sanders said that "the American people are never going to elect a president who insults Mexicans, who insults Muslims, who insults women, who insults African Americans." Neither of them, however, were willing to address the question directly and either confirm or deny that Trump is racist. This sparked some irritation on Twitter, specifically amongst those who think that Trump is obviously racist. To many, the reluctance of both candidates to call Trump the "r" word when talking about the Donald was a textbook example of political cowardice. That frustration is understandable, as Trump has said many racialized things and proposed several racist policies during his campaign. That said, I think there may be more going on here than meets the eye. Every presidential campaign has its share of mudslinging. It's pretty rare, though, for a presidential candidate to directly call their opponent a "racist." It's practically unheard of, in fact, so it would probably dominate news coverage for a few days if one of them actually said that. My thinking is that both Hillary and Bernie recognize this. They know that, if or when they actually call Trump a racist, it will generate at least a couple of days' worth of headlines, and this makes it an excellent ace-in-the-hole for a general election. I can't help but wonder if Sanders' and Clinton refused to call Trump racist not out of timidity, but because they don't want to waste that bombshell just yet. Perhaps they'd rather wait until after the primary is over, when the media is focusing on just two candidates, to drop that line. Obviously, we can't know for sure yet. But don't be surprised if Sanders or Clinton drops the "r" bomb a bit later in this race.